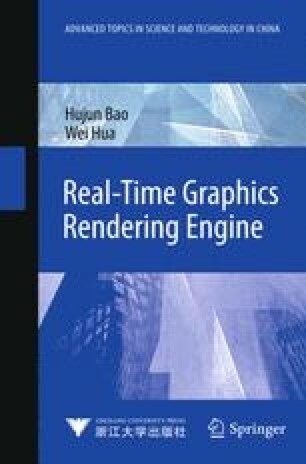 In this chapter, we are going to introduce the main parts of most rendering engines and, briefly, their functionality. Fig. 1.1 shows a classical structure of a rendering engine. In this graph, the rendering engine is composed of offline toolkits and a runtime support environment. The offline toolkit mainly comprises the tools that export data from the third party modeling software and the tools which perform some pre-operations to the Scene Model. These pre-operations include simplification, visibility pre-computation, lighting pre-computing and data compression. Besides these tools, the more advanced rendering engine includes some special effects generators. The main parts supported in Runtime are Scene Model, Scene Model Management, Scene Graph Traversal and Render. The applications call Scene Model Management and Scene Graph Traversal to run the rendering engine. In the following paragraphs, we will give a brief description of the core parts of the runtime support environment.